Former Chairman Ahern is off on his travels again. He was a guest of the Chinese government’s Foreign Policy institute in May and now he’s back again to impact his knowledge of things ecological. This weekend he’s been in China attending the Eco Forum Guiyang which is in the South West province of Guizhou. The full programme can be read on the conference website. Guest of honour (they even had a welcoming reception/courtesy call especially for him) Bertie advised the Chinese about cleaning up dirty industry. Tony Blair only made a video appearance. China Daily has two reports of his valued (no idea how much) inputs. Firstly Ahern spoke about that dirty industy issue. “We should work together and make a better and safer society for the next generation,” said former Ireland Prime Minister Bertie Ahern. 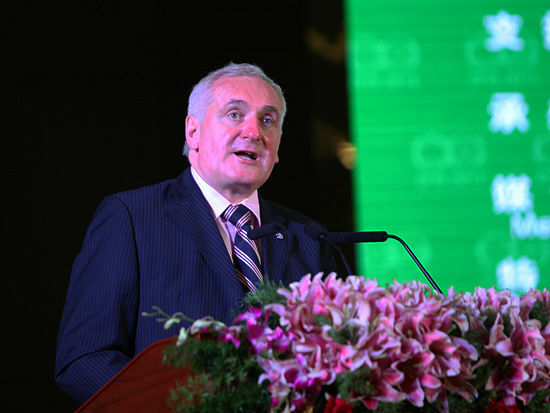 Also at the forum, Bertie Ahern, former prime minister of the Republic of Ireland, said eco-innovation is the key to achieving a sustainable world. Ahern on Saturday urged countries to turn more ideas into economic growth through products that reduce impact on the environment. Climate change remains an ever-pressing global issue, he said, citing International Energy Agency data that suggests carbon emissions were at their highest in 2010 after a brief dip in 2009 due to the global financial crisis. The Green Party will be so proud of him! There were other Irish participants at the conference from the Dublin Institute of Technology speaking about the Eco City of Clonburris. Yes I wondered where that was myself. The Office of Bertie Ahern tells us that Mr. Ahern has recently spoken to the Basque people about creating a lasting peace. This being one of his stock speeches as advised by his agents in the Washington Speakers Bureau who sort the Bertie Earners.